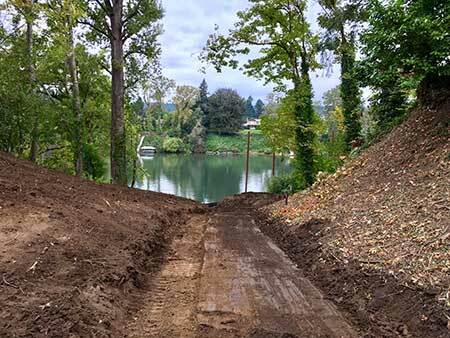 Many, if not most, of the landings on the Willamette River were natural stream cuts to the river that were originally used by Kalapuya natives. The landing in Butteville is a naturally occurring slope created by the seasonal stream that runs around La Butte (the large basalt hill west of town) and drains down Butte Street. The Kalapuya would have used the landing to access the river, and camped seasonally on the high ground where the community of Butteville is now located. Assessor’s map of Butteville showing old stream running down Butte Street to the landing. Hudson Bay Company trappers principally used canoes for travel and transport, so they tended also to use the natural landings utilized by Native Americans. Larger craft such as keel boats which transported agricultural goods would likely also have used the natural landing. The advent of stern-wheeler boats, that were steam powered and higher off the water in the 1850’s would have resulted in some amount of excavating or grading, and eventually the construction of docks with pilings. Evidence of those docks, with their adjacent warehouses can be seen in the 1905 photo taken from the ferry landing across the river. Products transported downriver would go as far as Canemah, just above Willamette Falls, where loads were portaged around the falls. 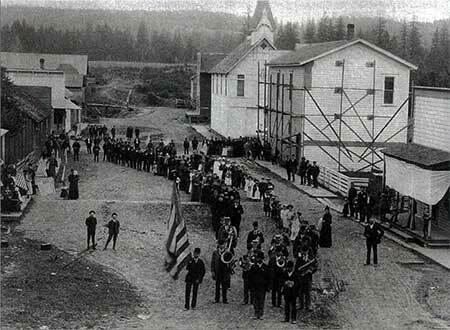 The first stern-wheeler steamship to ply the upper Willamette River was called The Canemah, and was built at Canemah and this community became the shipbuilding center for the region. Between 1851 and 1878, 27 steamships were built in Canemah to transport wheat, beef, agriculture, and timber products of the Willamette Valley to Portland and on to distant markets in California and the Pacific. In his book Willamette Landings, Howard Corning has documented 78 different steamboat landings between Canemah and Brantano’s Landing at St. Paul, and 25 different landings between Boones Ferry (south of Wilsonville) and Champoeg. 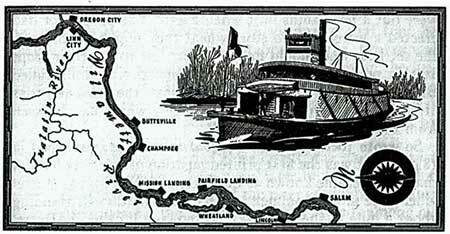 The river was the main transportation highway in the 1800’s! Most named landings used by early settlers would have been natural landings where the bank was low and accessible, and loading/unloading took place over gangways dropped to the bank. Only the larger and busier “river port towns” had docks. What made Butteville different and so successful was proximity to the high production agricultural area of north French Prairie and the location of one of three major north-south ferries across the river between Portland and Salem. 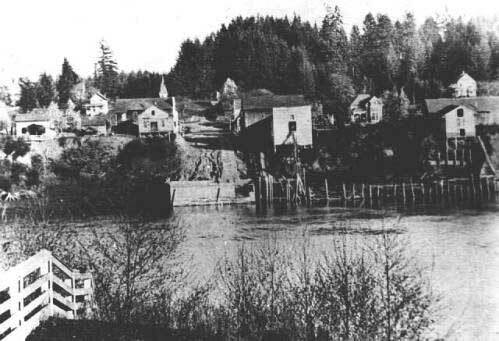 The landings of Butteville and Champoeg competed to be the principal ports servicing French Prairie farmers and ranchers who sought to transport their goods to Willamette Falls mills. Champoeg had the advantage until the flood of 1861 washed away the town. Butteville was also damaged by the flood but survived and recovered to grow as the principal shipping port above the Falls for agricultural products. During this period French Prairie’s principal crop was wheat, and it was one of the early centers of hop production in Oregon. 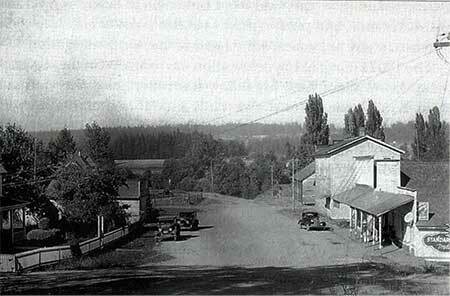 Butteville housed hop insurance companies, warehouses and shipping facilities for this agricultural sector. However, major changes in transportation were on the horizon! 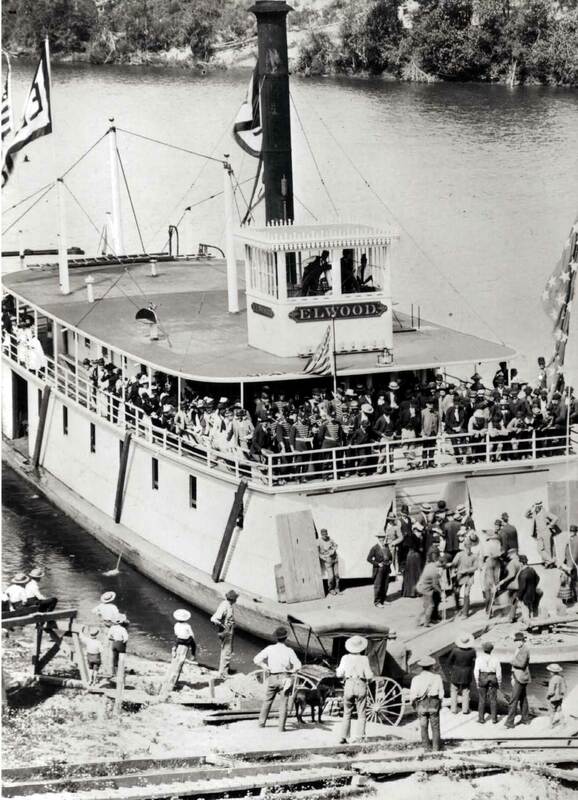 The stern-wheeler Ellwood docks at Butteville Landing circa 1890-1899. Note the number of passengers on board, and the use of a wood ramp with rails for transporting freight up and down to the landing from warehouses above. Access to the river and its docks was down Butte Street, the main street in Butteville. Completion of the locks at Willamette Falls in 1873 made river transportation to and from French Prairie all the more attractive and profitable, as the most direct route to Portland and the mouth of the river (42 miles) could now be completed without a stop, portage or transfer. With the arrival of the “east-side” railway (then Oregon & California Railroad, now Union Pacific Railway) at Aurora in 1871, Butteville’s days as a major shipping port for wheat and other products began to fade because of the faster shipping option to Portland. Still, there was the journey to Aurora. However, in 1908 when the “west-side” electric railroad (today’s Pacific and Willamette Railroad) was built across the Willamette River [delete “in 1905”] with stops within a few miles of Butteville (at Arndt Road, Fargo, and Donald) the economy of Butteville really declined as the port and river traffic were displaced by the railway. 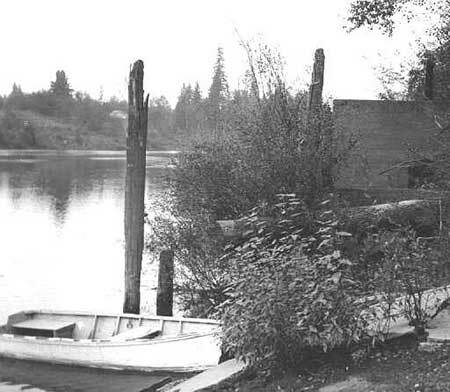 This was the event that spelled the end of the stern-wheeler period on the Willamette River, and over the next fifty years, Butteville became a small rural residential community in French Prairie. 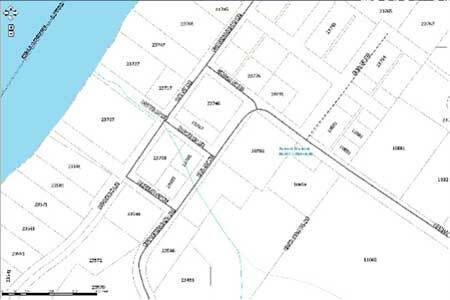 What was left was a ferry crossing and the remains of docks and warehouses. View to north up Butte Street from the Landing, 1961. 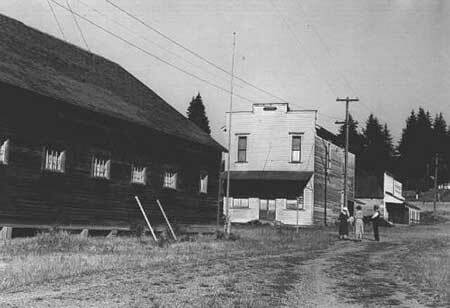 The white building is the Odd Fellows Hall north of the Butteville Store. Dark building is a warehouse at corner of Butte and 1st Streets. 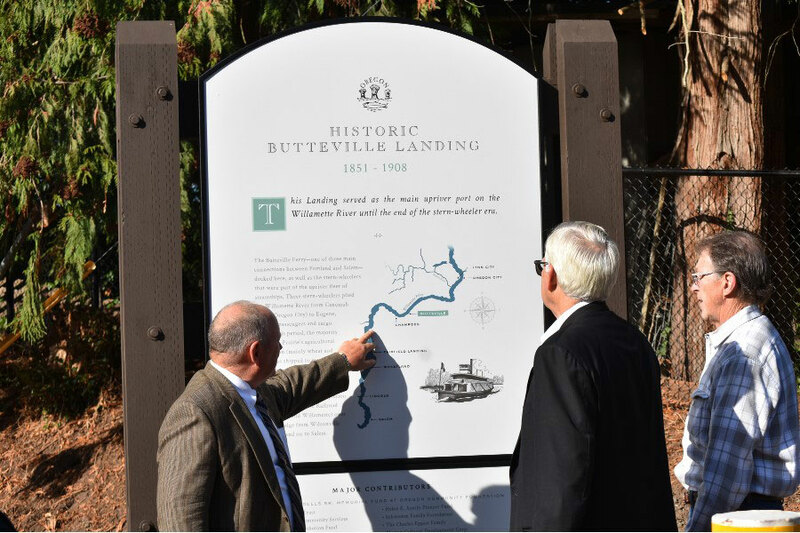 What is today referred to as “Butteville Landing” is actually a right-of-way owned by Marion County that runs down to the river from where Butte Street turns east to become 1st Street NE. It has been periodically maintained by the County to provide access to the river. 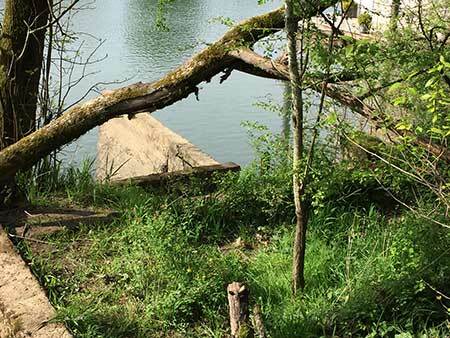 By 1938, after decades of not being used as a dock landing, the access was overgrown. As recently as 1954 the landing at the bottom of Butte Road was still usable for access to the Willamette River. Until recently access has been rough, there being no improved path or trail, and the slope being somewhat challenging. At the bottom are the remains of concrete footings dating back to the early 1900’s, when the community upgraded the docks to handle larger and increasing stern-wheeler and ferry traffic. Thanks to a Marion County Community Planning grant, FOHB was able to complete a topographical survey, develop engineering project plans as well as landscape architecture plans for a restored Butteville Landing. 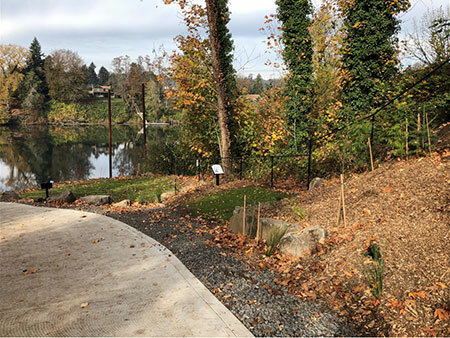 Receipt of some small grants as well as significant contributions to our Capital Campaign made possible the first phase or restoration: removal of invasive brush and trees, rough excavation and installation of soil erosion to prepare for winter. The old roadbed down to the docks exposed! The Landing prepared for winter 2017 with erosion control in place. 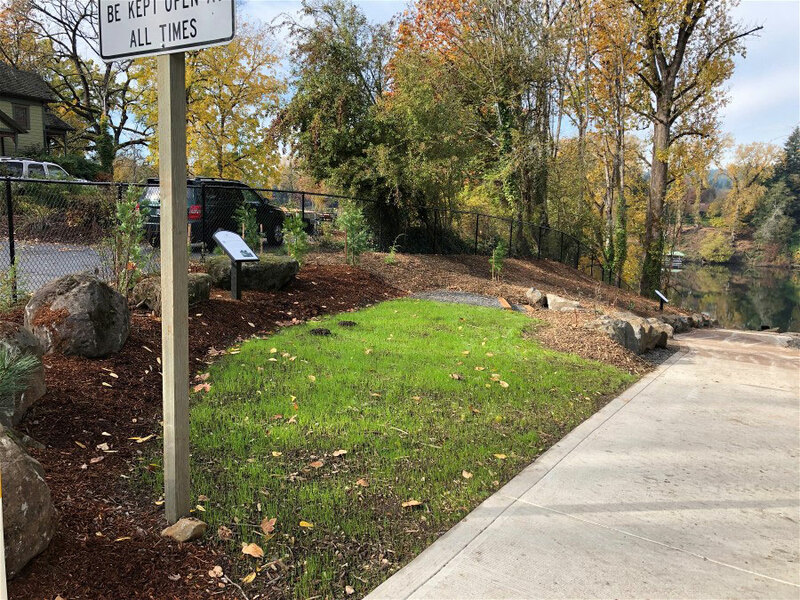 Thanks to a major grant from the William Swindells Fund at Oregon Community foundation, and many other nonprofit and individual contributions, 2018 Restoration Work included final grading and boulder wall placement for slope stabilization, installation of a 10-foot wide concrete trail, property line fencing, interpretive signage placement and landscaping. The year’s work was capped off with a Ribbon Cutting ceremony involving Marion County Commissioners Sam Brentano and Kevin Cameron in October. 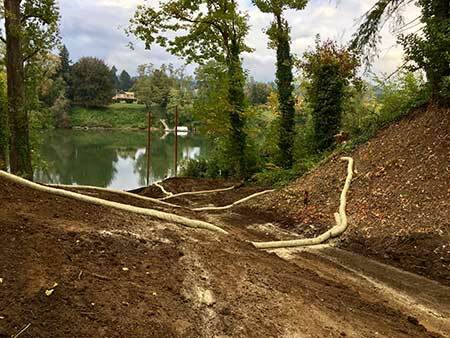 The scene is now set for the final phase to provide public access to the Willamette River. 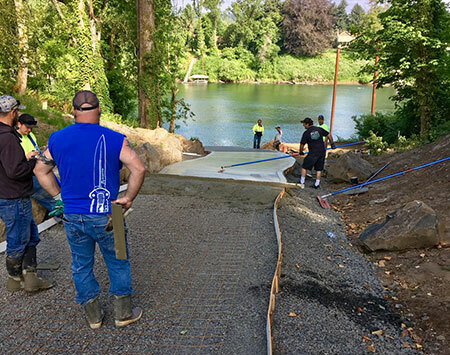 Concrete trail poured in June, 2018. Lower picnic areas by the river. Upper picnic area at Landing entrance. Ribbon cutting ceremony, October 2018. 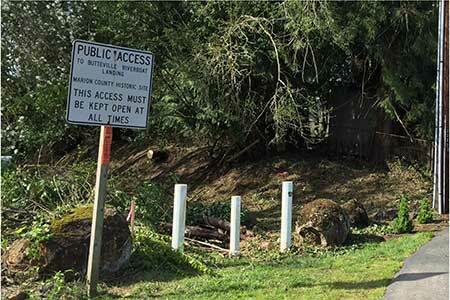 Friends of Historic Butteville is proceeding with fundraising and planning for Phase 3 of the Landing Restoration. This phase will include final grading, installation of a ten-foot wide concrete trail down to the river, placement of two picnic and view areas and installation of native plantings. 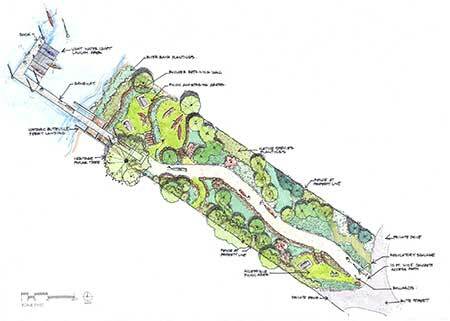 Phase 4 of the project in 2019 aims to install a gangway to a small dock that will hold a paddle craft dock as well as accommodate small power boats. 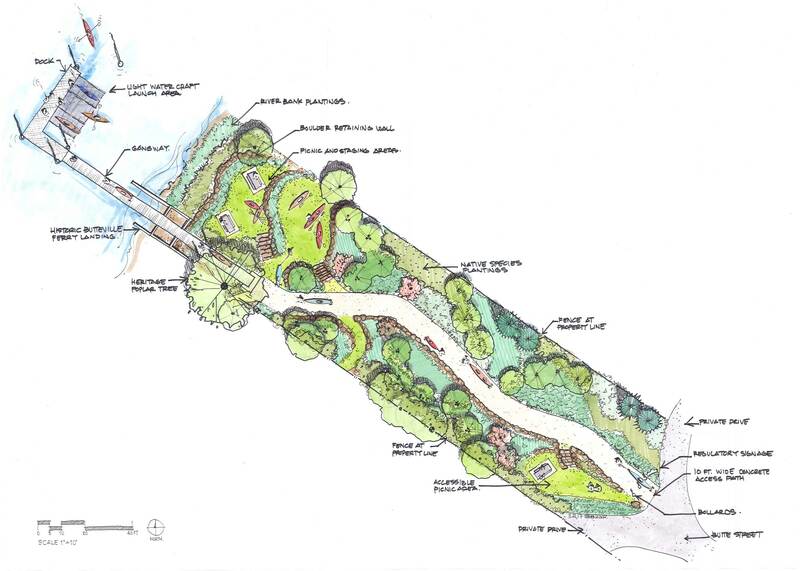 Concept drawing of improved Butteville Landing with trail to paddle dock on the river, prepared by Steven Koch, Koch Landscape Architecture.